Thanksgiving is such a wonderful time for my family. We enjoy the traditional recipes, and one of our favorites is pumpkin pie, and pretty much anything pumpkin! The trouble is, you can’t have the pumpkin without the bees. Pumpkins begin as yellow flowers, such as the one below, and depend on bee pollination (read more about squash pollination here). Most specifically, squash bee pollination. Each plant hosts male and female flowers. The male flowers have both nectar and pollen, while the female flowers carry primarily nectar. Squash bees visit both to get a complete diet, and in doing so, they cross pollinate the pumpkin flowers, which leads to the birth of a pumpkin! Bees need both nectar and pollen to survive; flowers need bees to become fruit; humans eat whatever fruit results. Our survival is interconnected! Squash bees are native solitary bees, meaning they nest alone, but may be next door to many other independent squash bee nests. 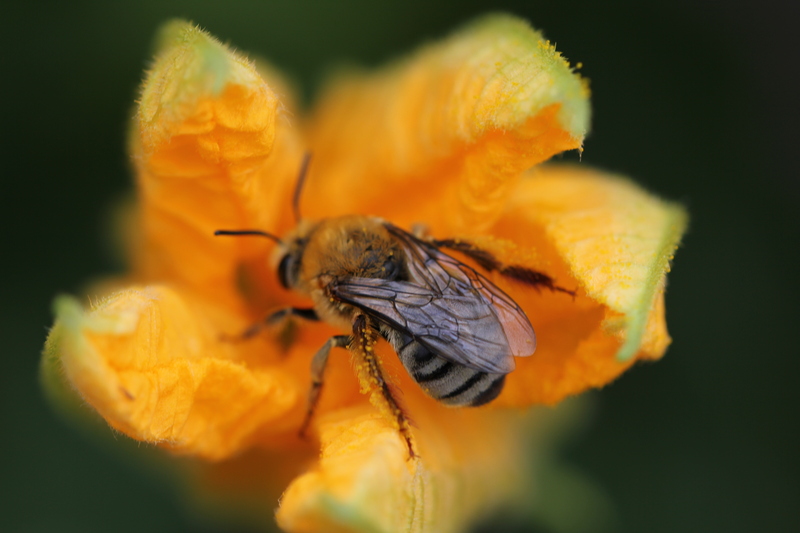 Squash bees depend predominantly on squash pollen and nectar. So, naturally, they are the bees pumpkin flowers depend most heavily on to become pumpkins! I have observed squash bees face down in squash blooms for minutes at a time, ignoring my presence, indulging in what must be top shelf nectar. Watch them in action here! Squash bee (Peponapis)-look at all that pollen on her legs! Squash bees (follow this link to read more about squash bees) match their life cycle with the blooming cycle of squash plants, and will even go so far as to build their nests under squash plants. This is risky business, as squash fields and gardens are cleared and tilled at every season’s end. This practice, if done deeper than 20″, kills the developing brood located under many of the shriveled up squash plants. A good solution might be to designate a plot of squash plants that will go untilled and left until spring. This way the bee population is preserved, and maybe even increased the following year. This is a practice easily done in our own yards, thus building more much needed habitat for native bees! Check out this video of hide and seed with a male squash bee! Wild bees play a larger role in our survival than you might think. Honeybees are recognized because they are managed for agriculture, and they provide a sweet treat, but honeybees have been taking center stage! Wild bees consist of thousands of different species, and are often excellent pollinators, better than honeybees, but they do not make honey, making them of quiet importance. Wild bees are a necessary support system for the planet’s pollination needs, and this includes food production. The more we can do to help all bees and all pollinators, the more we are helping our own survival. The topic of bee conservation doesn’t need to end at the end of the growing season. Food is a topic of never-ending importance, traversing across all seasons, and bees help us get the majority of our important, nutrient rich foods. The beauty of wild bees is you don’t need to suit up, or purchase an expensive box to house them, you simply need to plant a variety of native flowering plants, and provide nesting options in your yard. Bees need our help to bounce back and begin thriving again. Choose organic (and by this, I mean pesticide free) produce as often as you can. Don’t use pesticides, or other chemicals that might harm bees or their habitat requirements. Plant lots of native, organic flowering plants every year, and watch your yard come to life! Don’t forget to spread the word this Thanksgiving! Thank you for joining this incredibly important movement! I spend hours in my garden everyday during the warm months of the year, observing the life that bounces from flower to flower below, and from limb to limb above. I listen to the audible expressions of the visitors who frequent the fruits of my many years of outdoor labor. Many days I see repeat visitors, and every so often I catch a glimpse of a new arrival, and very rarely, I am prepared with my camera in hand. This is something I must improve upon, as magic doesn’t present itself on any particularly predictable schedule. My luck was on point this day that I found this lovely creature perched on Catmint in the early hours of the morning. Of course, it was my phone camera, but a camera nevertheless! She is a bee of the Apidae family, one of diverse size and color, including the bumblebees and honeybees. Anthophorini has two species, Anthophora and Habropoda. Anthophora means “flower bearer,” while Habropoda means “graceful/delicate foot.” To me, she is about the cutest bee I have ever seen! So, the meaning of the names suit her very well. From my vantage point, I couldn’t easily or accurately determine which one she was, but her characteristics are definitely Anthophorini. These bees have more hair than the average bee, and often have hairy legs, sometimes looking like leg warmers. The colors can range from slate gray to rusty-red to black! Wow, what a range. Some nest in twigs, but the majority nest in tunnels underground with many neighbors, otherwise termed an aggregation. Their size can range from 1/2″ to 1″. Interestingly, this genus of bees are very good buzz pollinators, and all this time I was thinking bumblebees (cousins of Anthophorini) were the rock stars of buzz pollination! This means they are great for tomato and blueberry pollination, among other plants with fused anthers. One very interesting fact, I found worth everyone knowing, is that not all of these bees emerge in the same year! That means that there are bees of this genus resting in diapause for 2, 7, and even 10 years! That’s astounding to me! How do they know when it is their year? They are cooped up in a tiny room deep underground, where the sun doesn’t shine, and the surface are hardly felt, and they somehow know it’s time to emerge. That’s a miracle! I have found the natural world to be endlessly entertaining, and one of the best teachers. Learning from the natural world will never become dull. And with that, I will leave you with a quote I recently stumbled upon. “Above all, watch with glittering eyes the whole world around you, because the greatest secrets are always hidden in the most unlikely of places. Those who don’t believe in magic will never find it,” Roald Dahl. Now, I’m off to find more magic to share with you! Won’t you go and find some magic too? Digger bees are devoted sunflower seed setters, as they love the sunflower family blooms. I was very lucky to capture both male and female digger bees dining side by side. 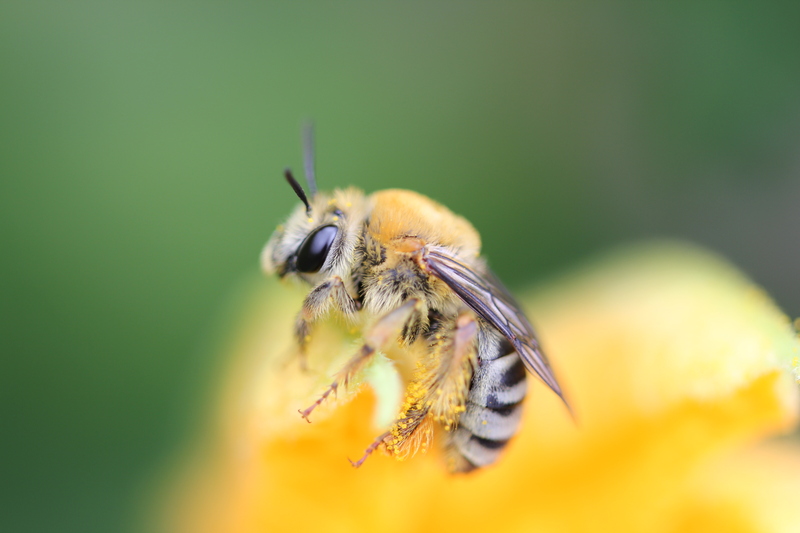 Learn a bit more about digger bees here. Lady digger is on the left and mister digger is on the right. The male has very long antennae for mating purposes. Check out the video posted on YouTube by Karla Thompson. Please do share what you learn, and thank you for joining the movement to save our bees! I introduce to you, the Melissodes bee! Look at the pollen all over this bee, and check out those antennae! Commonly named the Long horned digger bees, these beauties are late to emerge, and pollinated flowers of similar timing, such as gumweed seen in this photo. I spotted these bees on a hike up Mt. Sanitas in Boulder, CO, last week (August), and of course had to pull out the camera! The bee in the picture is a male, and I know this because he has very long antennae, whereas the females have shorter antennae, about half the length of the male’s. Unfortunately, I didn’t see any females the day of the Mt. Saints hike. This is likely due to the fact that males emerge sooner than females, and I was lucky enough to witness the beginning of digger bee season! However, I may have seen a female on a hike last fall near Frisco, CO. Have a look. What do you think? Another difference between the sexes of these bees, is where they slumber. Males will cluster together on plants, or in crevices in rocks stacked on top of each other to keep warm until morning. Females sleep underground in the nest they are building. The title “digger bee” has a literal meaning here. The females dig into the ground to create nesting cavities. They like loose sandy soil, because they will backfill the nesting hole with loose sand every time they leave to forage for nectar and pollen. This serves to camouflage the nest, thus protecting it from predators. Although these bees are solitary, they will happily form aggregations of neighboring nests, and sometimes even sharing an entrance leading to many different nesting rows of different lady bees! Longhorned bees are late arrivals, and have been known to fly into October, pollinating fall blooms. They gravitate toward flowers in the sunflower family, but they’ll happily behave as a generalist and take whatever nectar and pollen is available at the time. Look at this photo bomber bee! I was photographing the butterfly, and didn’t realize I had captured two pollinators! Can you identify this bee now? Grow lots of sunflowers and late blooming perennials. Provide a small mound of sandy soil. Take the time to observe everyday, because the smallest creatures are also the hardest to catch in the act of living! Cheers to joining this very important movement! We are approaching the time we will begin to see squash blooms, and there is a very dedicated little bee to squash blooms! The Squash Bee, or Peponapis, insists that squash pollen and nectar is the best food for her young. I have included some interesting bits of information for you about squash and how it is pollinated. Follow this link to learn more about the SQUASH BEE.